An experienced product manager and I were chatting over drinks about our chosen career path. In response to my typically enthusiastic assessment that product management is the best job, he observed that product managers can get niched over time and excluded from new opportunities in adjacent markets. Such personal concerns shape the product management recruiting process, creating subjective filters on skills and experience. Just as the recruiting process can niche senior product managers into narrow perceived swimlanes – she’s a storage person, he’s a Java guy – it can be brutal to those trying to get started without the “right” experience. 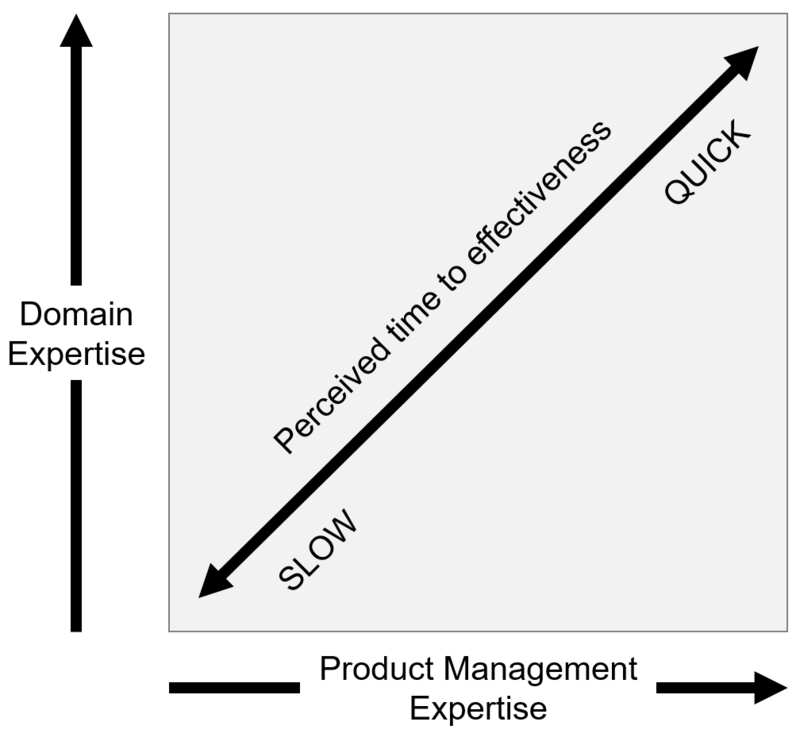 A product manager’s time to effectiveness is a function of her domain expertise in a target industry and functional expertise in product management. Interviewers assign varying importance to each variable based on their perceptions of organizational need and existing capabilities. I’ve spoken with product managers across the seniority spectrum about ways they can make a successful career transition. Some are starting out, wondering how to demonstrate their potential. Others have years under their belts and want to work with new technologies. They’ve all faced the need to lower their perceived time to effectiveness during the interview process. Smart interviewers will quickly identify a candidate’s lack of domain expertise or product management experience. Don’t try to bluff your way through experience by cramming the night before your interview. Bluffing, or making things up, kills credibility with a smart team. So what to do? By all means, demonstrate your domain and functional expertise. Showing that you can quickly learn a new technology or skill has great value. The conventional wisdom about coming prepared to an interview is absolutely correct. It’s disappointing when a candidate can’t muster a basic narrative about their aspirational employer or industry, thereby wasting an opportunity to demonstrate learning capacity. Yet these basic learnings won’t mask a clear gap in expertise. Thinking back to the interviewer’s mindset, however, provides a great opportunity to show how you will add value as a product manager from day one. Beyond daily product decisions lies your broader responsibility to guide product strategy based on market threats and opportunities. While both benefit from domain and functional expertise, threats and opportunities require a wider lens to detect inflections and adjacencies. Myopia induced by being too close to a product or technology can be as deadly as the reverse. Your fresh perspective can be tremendously valuable – if you demonstrate capability and vision during the interview. I’m impressed when a product manager candidate pushes back on our strategy and points out inconvenient weaknesses in our narrative – and we all have our inconveniences. Or when she recognizes an adjacent, emerging use case we have not publicly disclosed. Such observations become far more powerful when followed with strategy proposals to minimize risk and capture new opportunity. Product managers are recruited to be leaders, making these interview experiences tangible examples of how the candidate will immediately add value. Though acknowledging the candidate lacks the “right” experience, the interviewer can internalize a vision of strong leadership and strategic reasoning. The candidate’s time to effectiveness is reduced. Sufficiently researching your prospective employer and industry to develop a defensible thesis of their threats and opportunities takes time. You may wonder if doing this for every interview is worth the effort. Not doing so is a huge disservice to you. Committing yourself to a business with unknown risks is gambling with your career. First, know the risks you’re signing up for. Then, develop a strategy to reduce those risks when placed at the helm as product manager. You’ll go into the interview being able to tell a relevant narrative. Why did we build this feature?